A simple scaling tool built around 50 key indicators for mental health and balance. 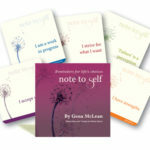 The five suits and 50 statements that make up the Growing Well cards are available as gummed, A4-sized pads. Each statement is accompanied by the same visual rating scale of a seedling growing into a tree. These scaling sheets are simple, practical, highly accessible paperwork tools that can be dated, written on, given away, used over time, and included in a case file or service folder if required. People using the pads can do their own recording on each sheet or they can do so with a carer, support worker, therapist, clinician or case manager. 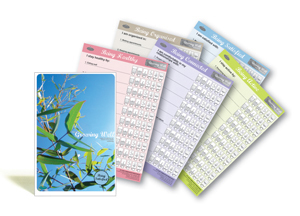 While originally designed as a self-assessment tool for people accessing mental health services, the pads can be used by anyone who wishes to actively engage with their own wellbeing. The pads pack contains one complete set of 5 tear-off checklist scaling pads, each with 25 sheets.